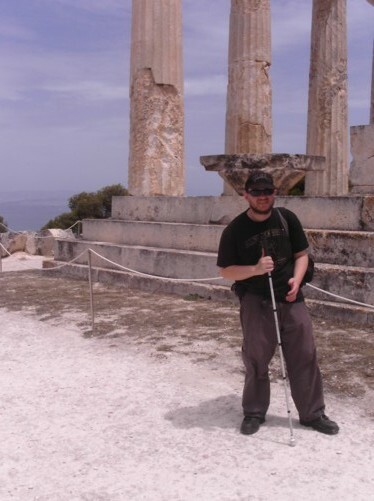 The Saronic Islands are located in the Argo-Saronic Gulf south of Piraeus, which is Greece’s largest port. 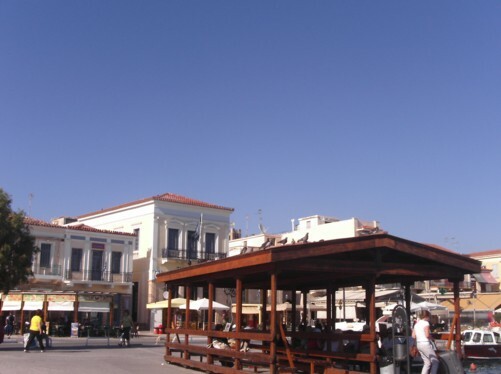 The largest island of Aegina is just 20 kilometres from Piraeus and can be easily and quickly reached by boat. Pictures taken Thursday afternoon-evening, Friday morning, 27th-28th May 2010. 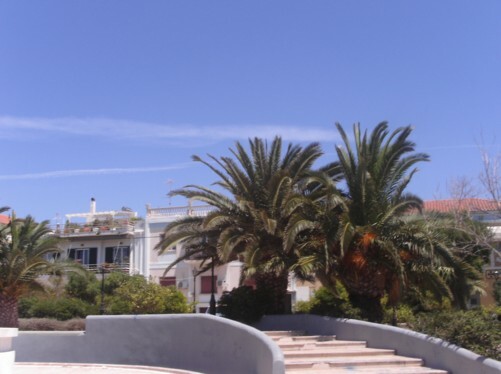 Park area in Aegina Town. 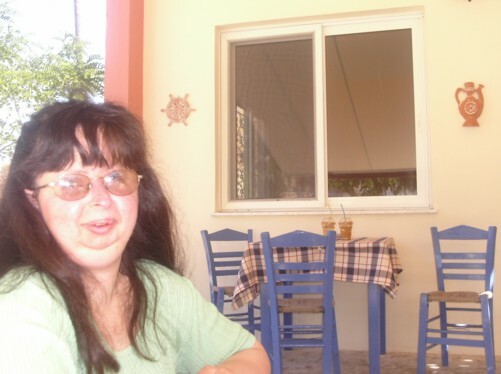 Tatiana at a café-restaurant in Aegina Town. 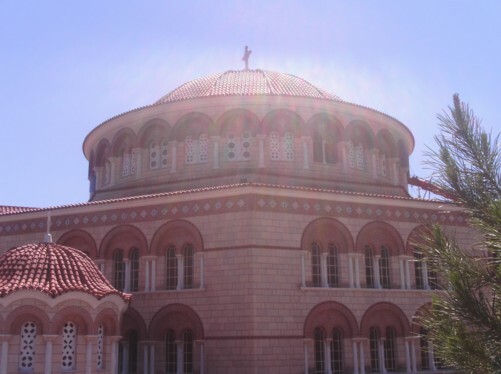 Dome of Agios Nektarios Monastery. 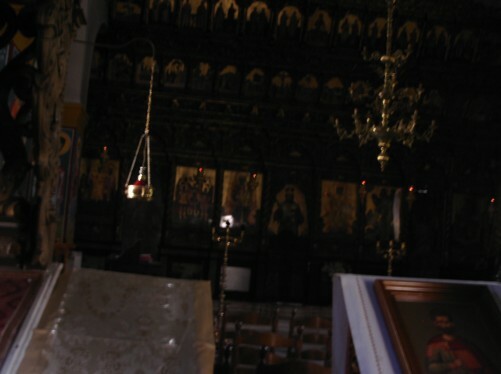 Inside the church next to Agios Nektarios Monastery. 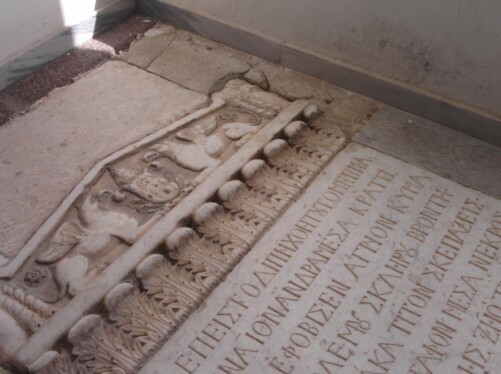 The picture shows a tomb containing the skull and bones of St. Nektarios, 1846-1920, who was known for his heeling powers. 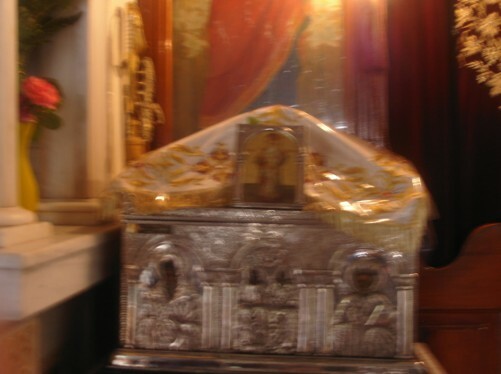 There is a mass pilgrimage each November, when Nektarios’s bones are paraded through the streets. 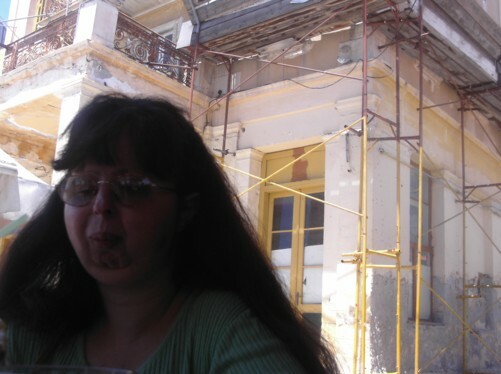 Tatiana in a taverna opposite the monastery. 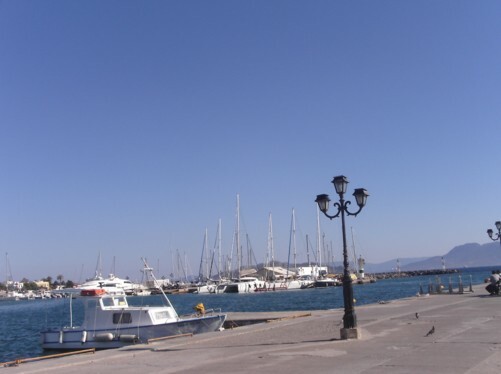 The harbour in Aegina Town. Waiting area in the harbour. People waiting on the harbour front. 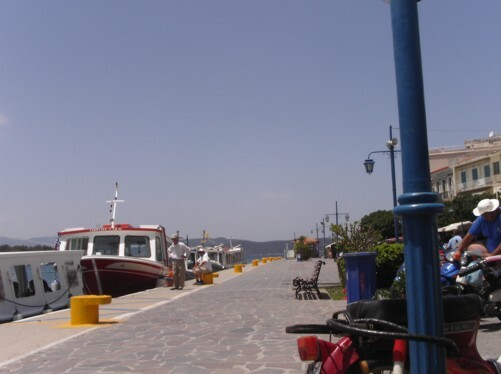 Skala, main port and second town of Agistri Island. Pictures taken on Saturday evening and Sunday, 29th-30th May 2010. Agistri island is mostly flat with beaches and some greenery, it’s very close to Aegina island and is served by water taxies and ferries. View from the balcony of Hotel Vasilaras. 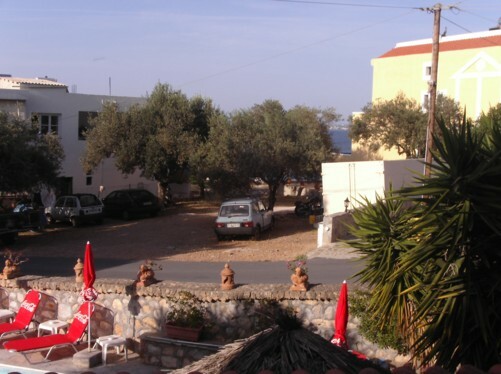 The hotel is located close to the port, half way up a hill. 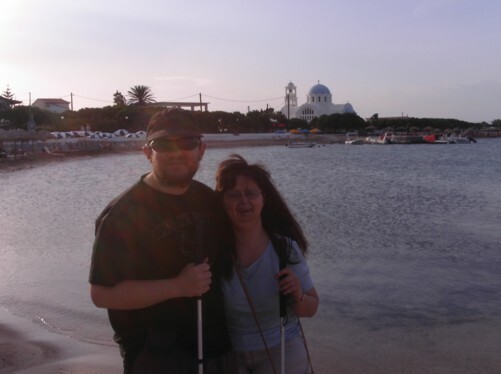 Tony and Tatiana on Skala Beach. 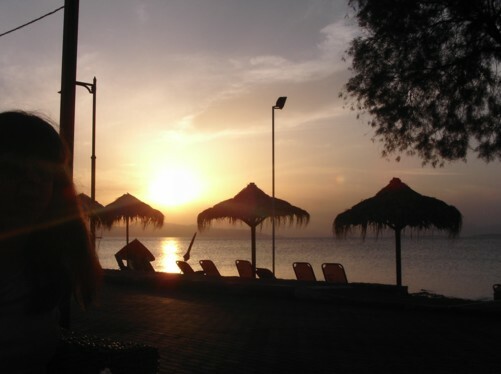 Nice view across Skala Beach. 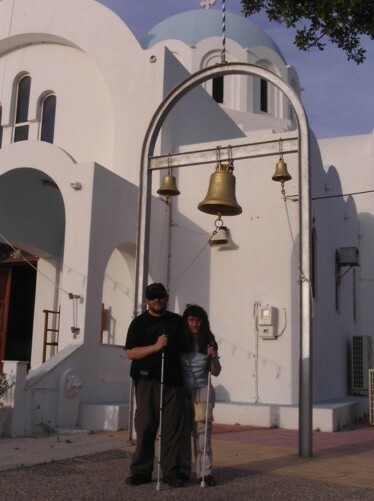 Tony and Tatiana by bells outside Agioi Anargyroi Church. 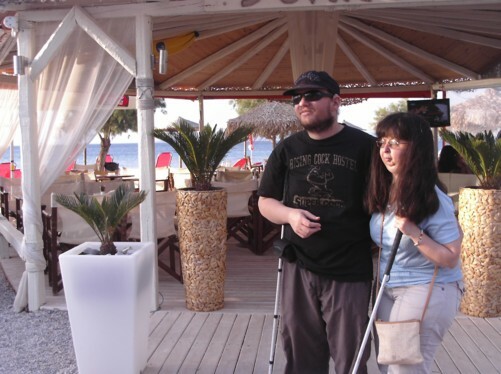 Tony and Tatiana outside a café on Skala seafront. 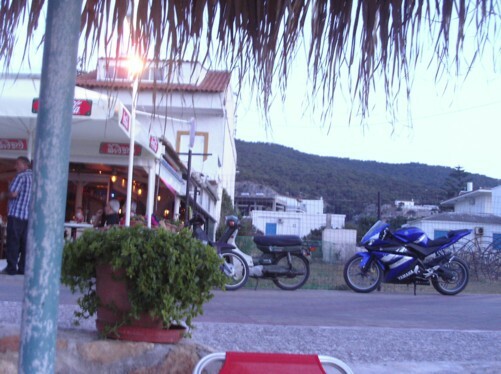 Tony and Tatiana sitting at a beach-side café. 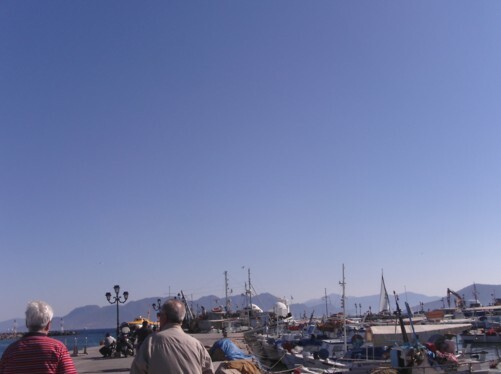 Aegina’s crescent shaped harbour with neoclassical houses in the background – some painted in bright colours, some not. 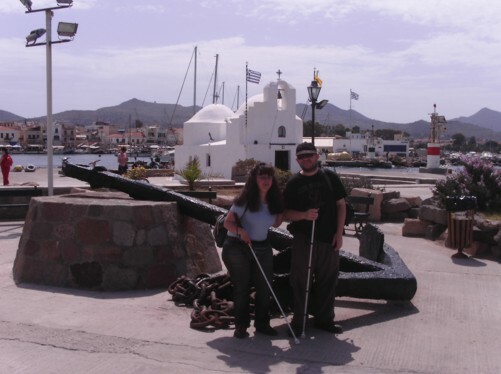 Tatiana and Tony stood by an old ship’s anchor, Aegina harbour. 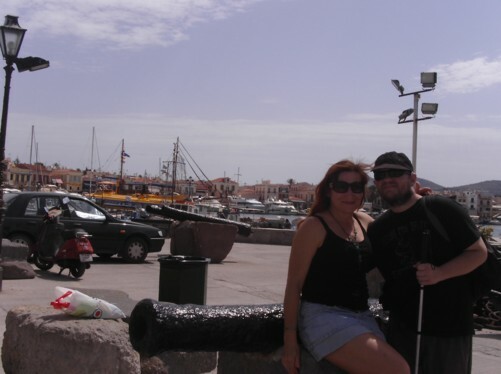 Elena and Tony by a small cannon. 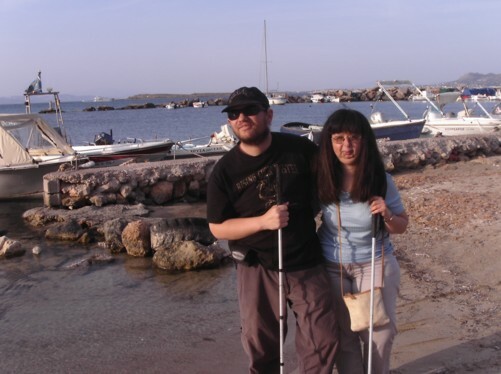 Elena is from Ukraine, now a resident of Agistri Island. 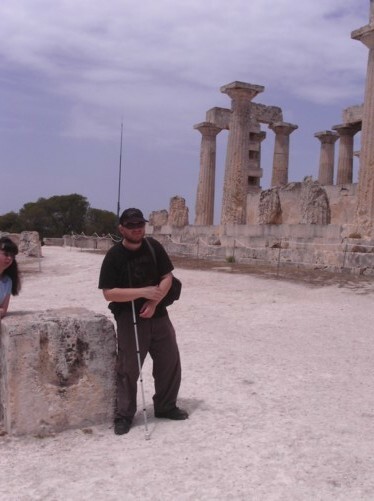 Tony at Athia Temple (APHAIIA or APHEAE). 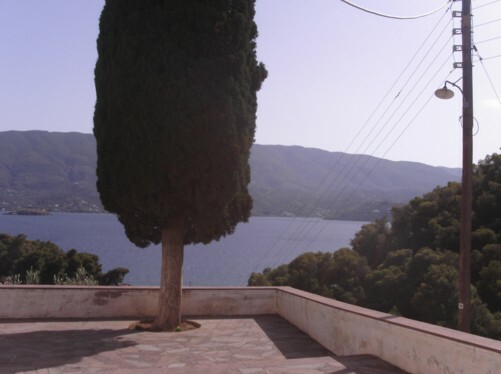 The temple stands on top of a hill lined with pine trees, about 4 km from the tourist port village of Agia Marina. 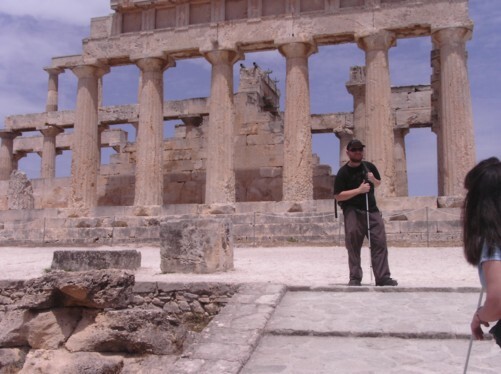 The doric temple was built in the 5th century BC and 24 linestone columns remain as an example of its former structure. It was dedicated to Aphaia – a hunting nymph daughter of Zeus. 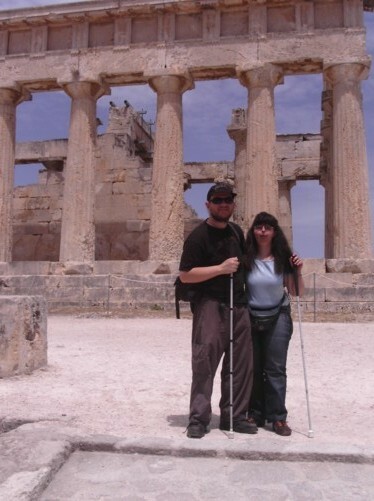 Tony and Tatiana at Athia Temple. 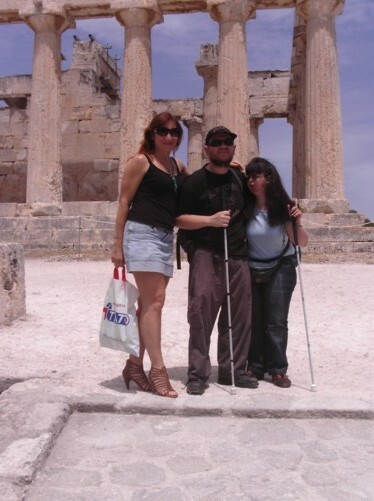 Elena, Tony and Tatiana at Athia Temple. 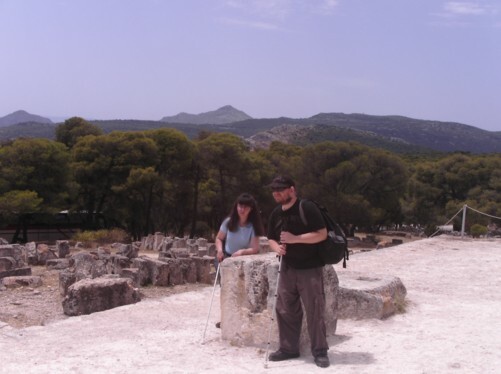 Tony and Tatiana by the east facing entrance ramp near the former sacrificial altar. 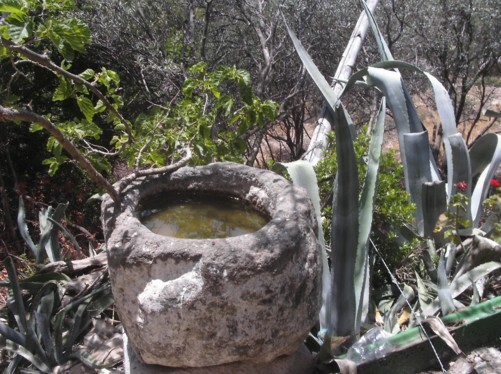 Another view near the former sacrificial altar. 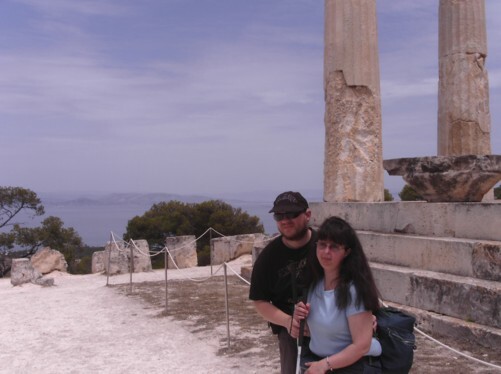 Tony and Tatiana at Athia Temple. Magnificent sea views behind. 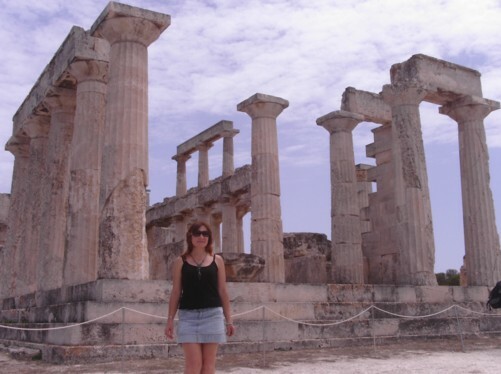 Elena in front of the stone columns of Athia Temple. 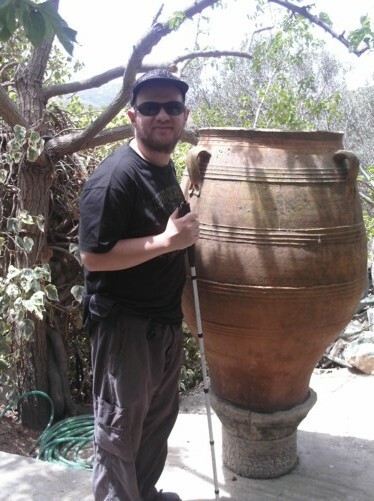 Tony by a large urn at an old style café opposite Athia Temple. Tony and Tatiana sitting in café. 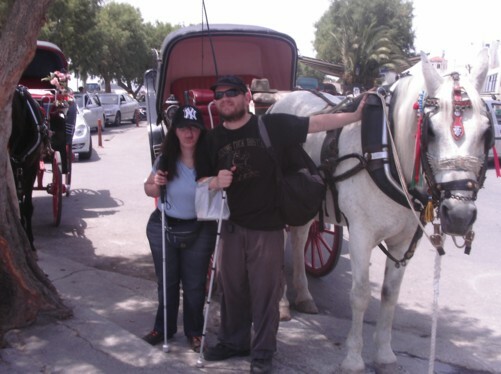 Tatiana and Tony next to a horse and carriage in Aegina harbour. 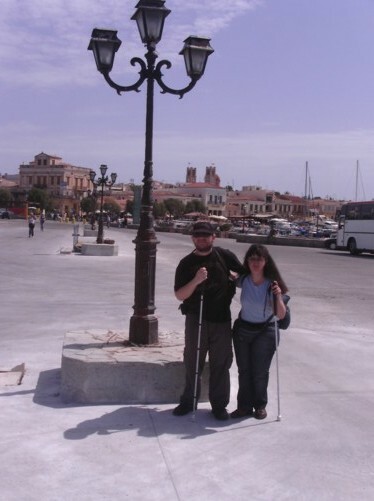 The horse and cart take tourists for an expensive ride around Aegina town. Monday, 31st May 2010. 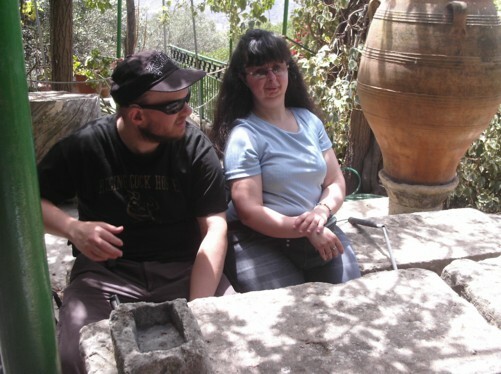 Most pictures taken at the historical Holy Monastery of Zoodochos Pigi (life-giving) on a pine forested hill 4km east of Poros Town. 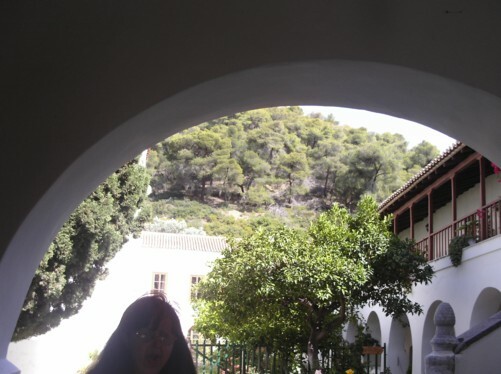 The monastery was founded in 1720 AD by the Archbishop of Athens, Iakovos (Jacob) the Second, who miraculously recovered from lithiasis after drinking from the holy spring near where the monastery was built. 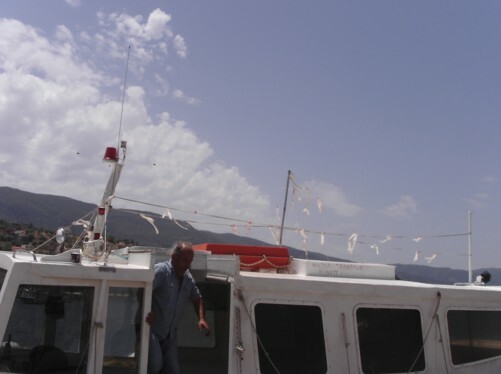 Passenger boat in Poros Harbour. 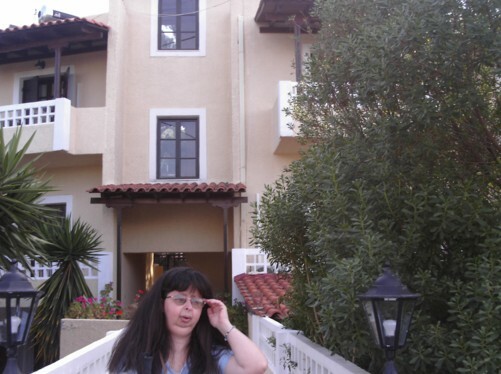 Tatiana at Zoodochos Pigi Monastery. Inside the Catholiko, the main church of the monastery. Stone inscription, Zoodochos Pigi Monastery. Nice sea views from outside the monastery. 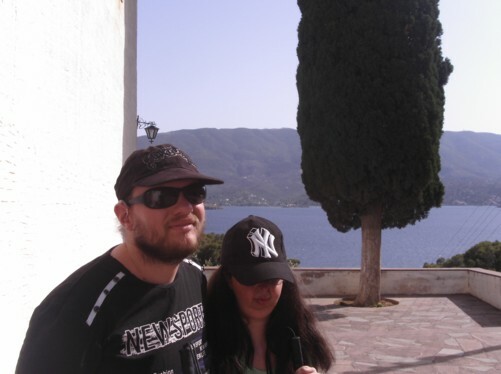 Tony and Tatiana, outside the monastery. 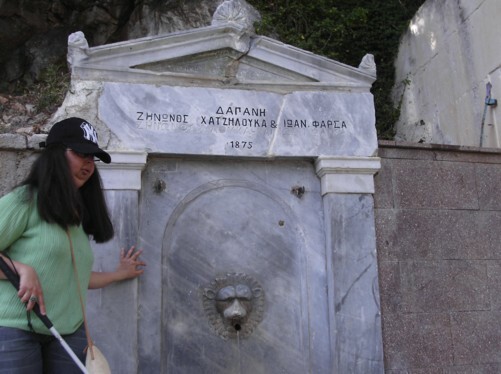 Tatiana by a life-giving spring opposite the monastery.